BELIZE CITY, Fri. Mar. 27, 2015–The Court of Appeal on Friday announced its decision to strike out a claim filed back in April 2011 by Belize Telemedia Limited, making claims for losses and damage allegedly caused by 7 former company directors and 4 associated companies, in a challenge to a move by the Ashcroft group to detach Great Belize Productions and its subsidiary Channel 5 from BTL, right before the Government of Belize moved in to nationalize the telecommunications company back in 2009. The decision, written by Justice Christopher Blackman with the concurrence of Justices Dennis Morrison and Minnet Hafiz-Bertram, supports the arguments by the attorneys for the appellants, that the directors are absolutely indemnified from any such claims under BTL’s Articles of Association, as well as a separate deed of indemnity dating back to September 2006. Amandala readers will recall that in reports to shareholders in advance of its 5th Annual General Meeting, held on December 15, 2011, BTL had said that it was suing ex-board members and companies associated with the previous owners, the Ashcroft group of companies, “for a total of BZ$21 million.” The company cited “unlawful and wrongful acts in connection with the disposal of the [BTL] Group’s [then] subsidiary, Great Belize Productions Limited,” which was owned at the time by Katalyst Development Limited, a company registered in the British Virgin Islands and which was detached from BTL just before the nationalization. 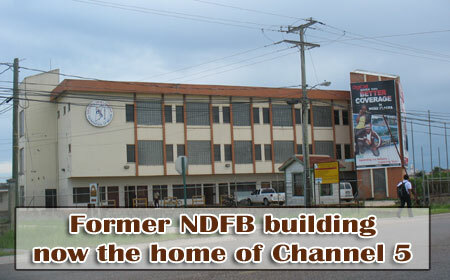 BTL had claimed that along with the detachment of Great Belize Productions, the former premises of the National Development Foundation of Belize (NDFB), now held and occupied by Great Belize Productions, was also stripped from BTL. BTL had claimed that in October 2008, the building was purchased by BTL, under its previous ownership, for $3.6 million using a company cheque, and BTL also suggested that company funds were also used to buy Channel 5’s shares. When the matter was brought up for hearing in the Supreme Court, then Acting Chief Justice Samuel Awich, now a Justice of the Supreme Court, had refused the application by the former BTL directors and affiliated companies of the Ashcroft group, to have the claim struck out. The former BTL directors and the companies subsequently appealed Awich’s decision, in which he had asserted that the indemnity which the former directors claim does not exist in the event of negligence or dishonesty. The Court of Appeal heard the matter back in November 2014, and on Friday, it handed down its decision, announcing that Awich had erred in not striking out BTL’s claim on the basis that the former directors were indemnified from any such lawsuit. The court went on to award costs to the 11 appellants. The appellants were represented by Eamon Courtenay, SC, and Jose Alpuche, while BTL was represented by Michael Young, SC. Young told Amandala that there is a distinct possibility that BTL will appeal the matter at the Caribbean Court of Justice, but he awaits instructions from the company on its final decision.